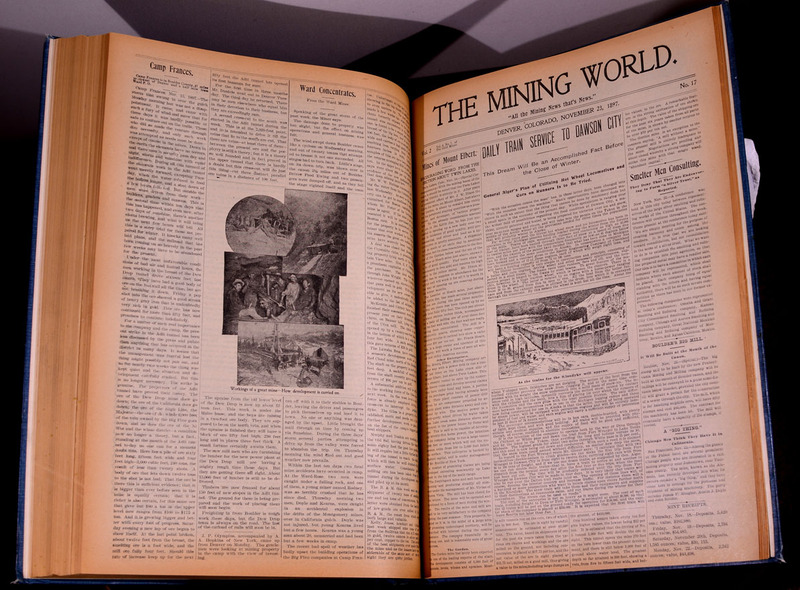 THE MINING WORLD, "All the Mining News that's News"
Denver, Colorado, February 9, 1897 - Volume 2, No. 22, December 28, 1897. Published by The World Publishing Company, 1850 Lawrence Street, Denver, Colorado. E. M. Hawkins, Manager. 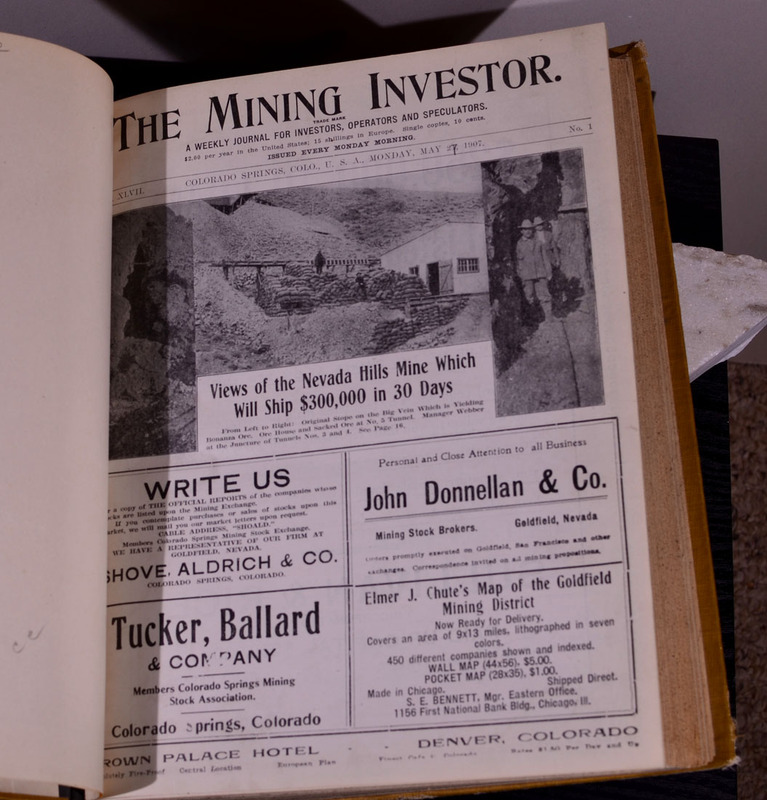 Issued Weekly to the Interests of Mining and Investors. Green-cloth bound volume with gold print on spine; approximately 526 pages. Each magazine 8 to 14 pages in length. 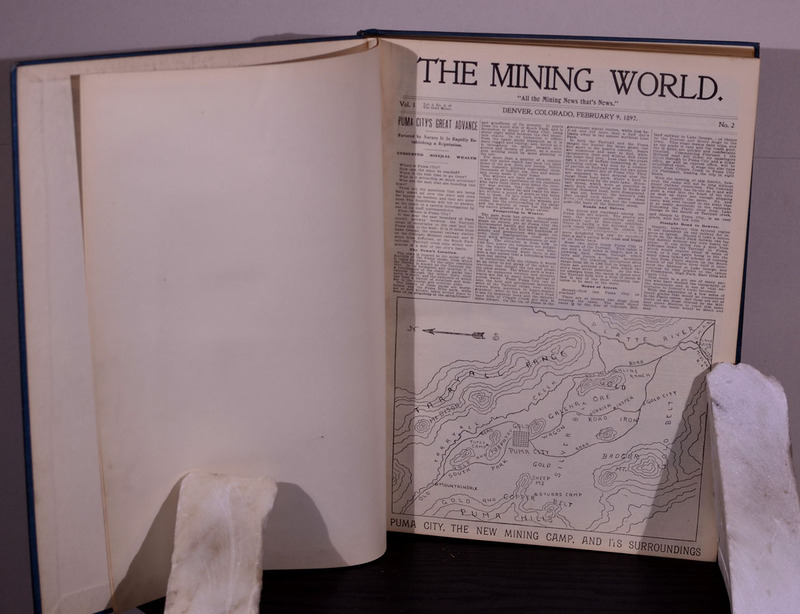 Illustrated with photographs and maps. Local and regional advertising. Articles generally concern Colorado mining, but also Alaska, with some coverage throughout other western states. Near fine condition. Tome 2: Volume 2, No. 23, January 4, 1898 through Volume 4, No. 21, December 20, 1898. Original green-cloth binding with gold print on spine; approximately 408 pages. 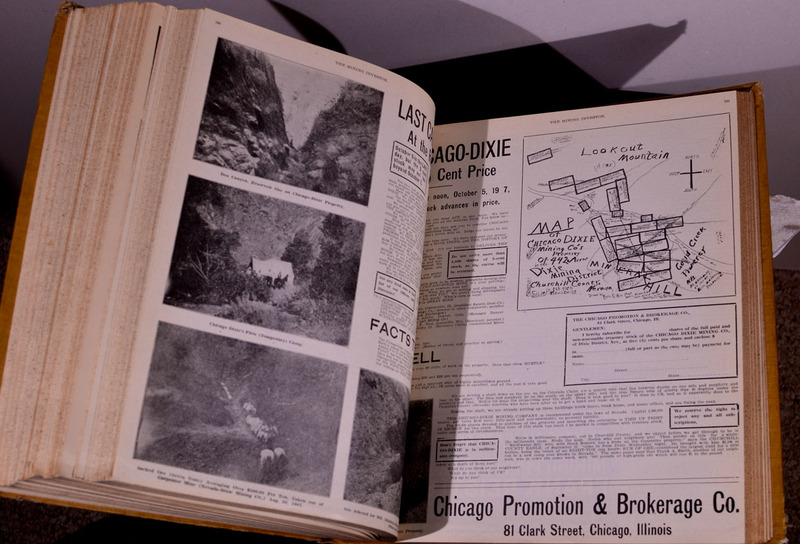 Illustrated with photographs and maps; local and regional advertising. Very good plus to near fine condition. Tome 3: Volume 4, No. 23, January 3, 1899 through Volume 6, No. 24, December 19, 1898. Original green-cloth binding with gold print on spine; approximately 162 pages. Illustrated with photographs and maps; local and regional advertising. Very good plus to near fine condition. Significant amount of information on mining developments in Colorado, especially in the Cripple Creek Gold Mining District. 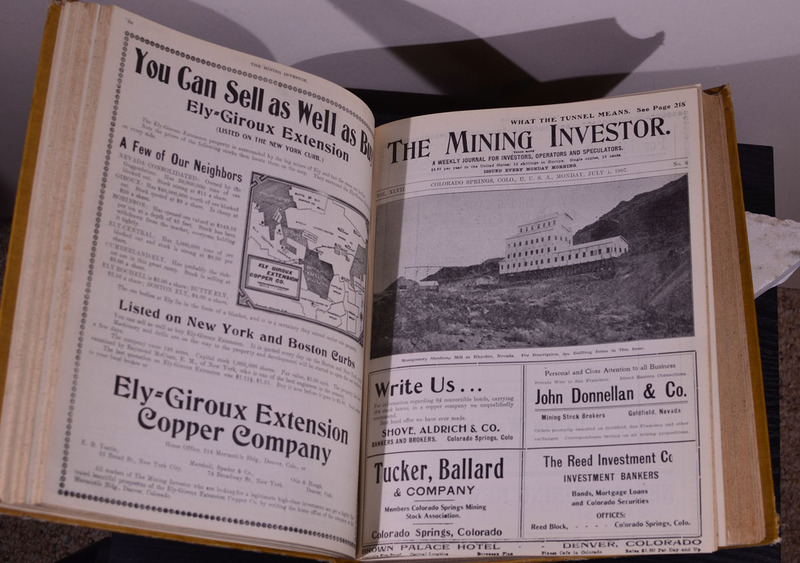 THE MINING INVESTOR, "A Weekly Journal for Investors, Operators and Speculators, Issued Every Monday Morning." Tome 1: Volume XLVII, Colorado Springs, Colorado, Monday, May 27, 1907, No. 1, through Volume XLVIII, Denver, Colorado, November 18, 1907, No. 13. Original tan cloth binding; 942 pages. 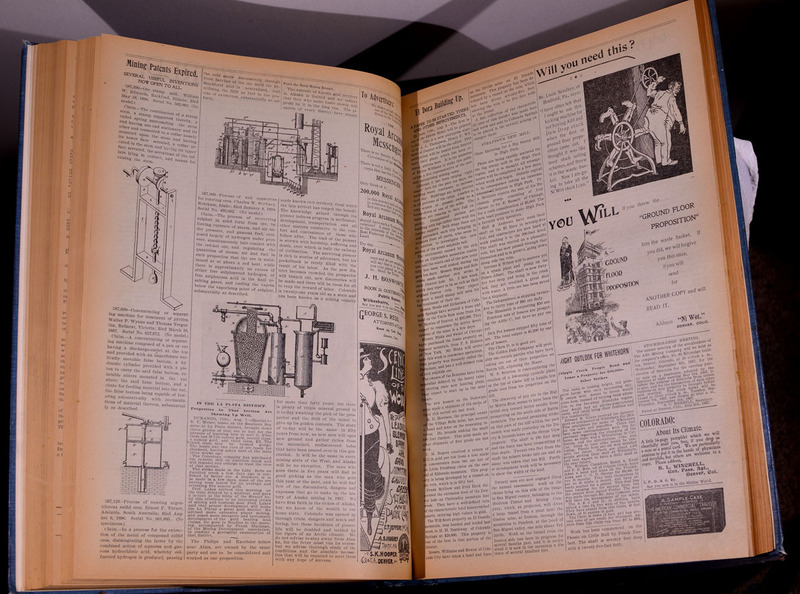 Illustrated with numerous photographs and maps; local and regional advertising. Tome 2: Volume XLIX, Denver, Colorado, Monday, November 25, 1907, No. 1 through Volume L, Denver, Colorado, Monday, May 18, 1908, No. 13. Original tan cloth binding; 542 pages. 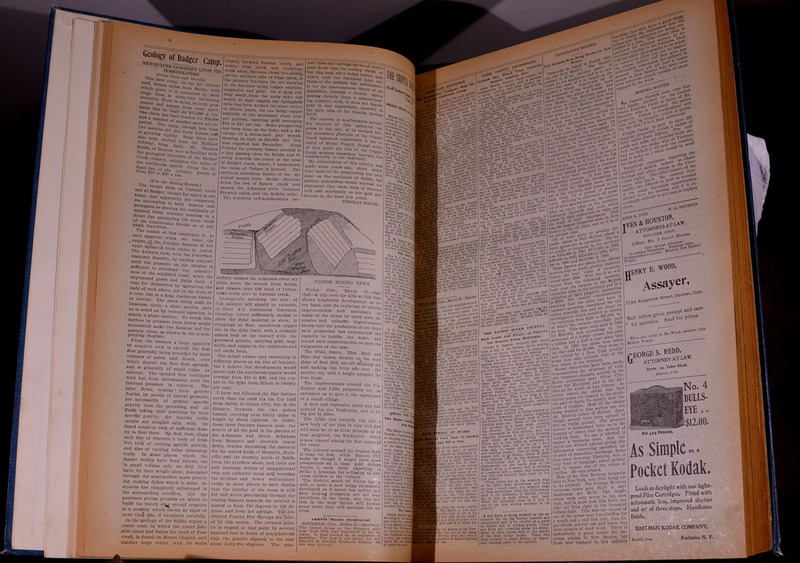 Illustrated with numerous photographs and maps; local and regional advertising. Tome 3: Volume LV, Denver, Colorado, Monday, May 24, 1909, No. 1 through Volume LVI, Denver, Colorado, Monday, November 15, 1909, No. 13. Original tan cloth binding; 308 pages. Illustrated with numerous photographs and maps; local and regional advertising. 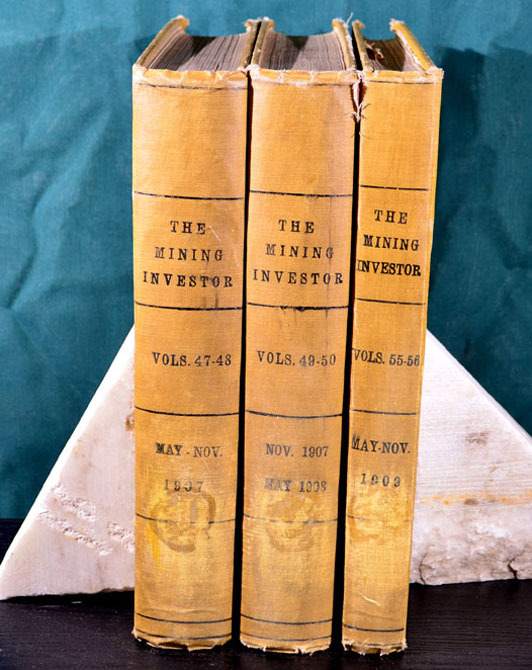 Overall condition of all three tomes: very good plus; interior pages, near fine condition.